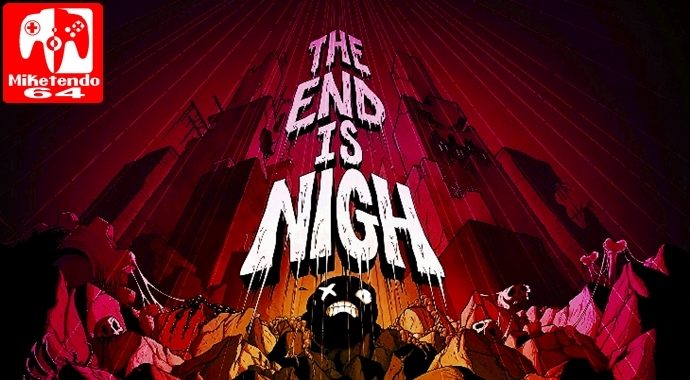 The End is Nigh is the latest brainchild of Edmund McMillen, the creator of Super Meat Boy and The Binding of Isaac, and serves as something of a spiritual successor to Meat Boy, using gameplay very reminiscent of its 2010 predecessor, albeit with some notable tweaks. Whereas Super Meat Boy’s primary hook was its titular slab of raw meat’s ability to slide and jump off walls, The End is Nigh stars a black, blob-like creature named Ash – one of the few survivors of an apocalyptic event – whose primary means of platforming is leaping from ledges. That’s a simple enough gameplay setup, but one that works wonders with some creative level design. The stages of The End is Nigh are bite-sized, single-screen affairs. The game’s “chapters” are comprised of several of these single-screen stages, with a refreshing lack of loading screens between them. The chapters will usually introduce a twist or two to the ledge-leaping gameplay, with each of the chapters’ stages building on the gimmicks they introduce. Whether it’s swimming in chemicals that will kill poor Ash in seconds, or platforms that lower of raise when landed on, The End is Nigh does a decent job at keeping its simple premise fresh. Like McMillen’s previous games, The End is Nigh has a notably steep difficulty curve. Thankfully, players have unlimited lives, and just like progressing to a new level, there’s no loading times in between death and respawning, so the frustration doesn’t get too out of hand. Still, you may get annoyed during certain stages that increase the challenge considerably from the other stages of their chapter. I don’t think The End is Nigh is as difficult as Super Meat Boy on the whole, but like its predecessor, there are some moments that are notably more aggravating than the rest. When you reach such areas and begin redoing them over and over and over, you may wonder if it’s all worth it. This is doubly true for the game’s bonus content. Hidden in every stage are “tumors” (yes, tumors), which can be traded to some NPCs in order to unlock additional levels, and each chapter hides a video game cartridge, which unlocks different mini-games. Though the levels can be creative, their utter brevity makes the idea of going out of your way to find the collectibles just to play more of them feel like a lackluster payoff. The mini-games are a bit better of a reward, though again, I think only a very niche crowd would want to take the trouble to unlock them. Aesthetically, The End is Nigh is pretty delightful. The visuals showcase a silhouette style, and although this isn’t the first indie title to utilize such a style, it’s one of the better looking ones. And the musical score is surprisingly lively and energetic. The End is Nigh is another fine entry in McMillen and co.’s expanding resume of games. It may seem a bit like Super Meat Boy-Minus at times, but that’s not exactly a horrible complaint. Ash is fun to control, the level design is enjoyable, and the game is fun to look at and to listen to. The extra content may leave a lot to be desired, and you may wonder if seeing the game the whole way through is worth it. But The End is Nigh ultimately comes together nicely.